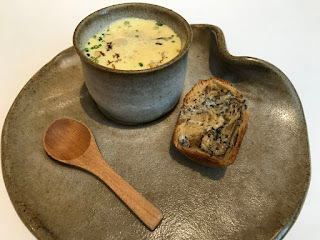 Back in June I had a chance to try chef Julien Royer's food at a pop-up he did at the Ritz-Carlton Hong Kong. Despite cooking in an unfamiliar kitchen, the dishes he presented were beautifully plated, and of course delicious. 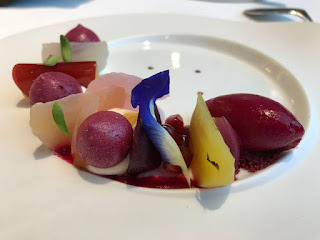 I vividly remember the beetroot, and the pigeon dishes, so flavourful and not heavy. So on my recent trip to Singapore I had to try his food again in his restaurant, Odette. It opened in 2015 in the National Gallery Singapore, the Supreme Court building re-purposed into an art gallery. 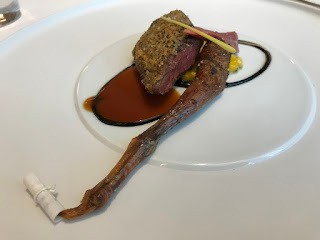 Odette isn't the only restaurant -- there are many others, like National Kitchen serving Singaporean cuisine, Yan with Cantonese food, and even a bar called Smoke & Mirrors on the sixth floor. But back to Odette, which is named after Royer's grandmother. He watched her cook as a child, getting all her ingredients from the farm in Auvergne, France -- he didn't grow up buying food from a supermarket like the rest of us. 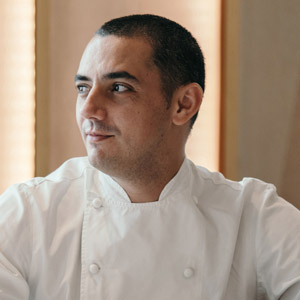 After working with the likes of Michel Bras Bernard Andrieux, Royer had a chance to go to Singapore -- at the time he didn't even know where it was on the map -- and worked at the St Regis Singapore's Brasserie Les Saveurs and then Jaan, in the Swissotel The Stamford before opening his own restaurant. 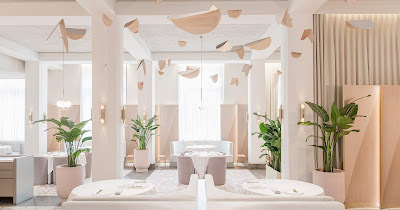 Inside it's airy with high ceilings, a very romantic palette of dusty pink, cream and beige, with an open kitchen off to the side, and diners seated in comfortable banquettes. The staff are well dressed, friendly and chatty with guests as they introduce each dish -- there is no atmosphere of condescension or arrogance. Everything is politely explained. One server admitted to us he didn't like beetroots at all -- until he tried Royer's dish that I mentioned earlier. There is a lot of attention to detail, from how the cutlery and tableware is designed to the execution of the dishes and how they are served at the table. We also liked the pacing that gave us enough time to eat, savour and digest a bit before moving onto the next course. So what did we eat? A lot, but we were not overly stuffed. First a trio of "snacks" -- a mini salad in a lettuce leaf with peas, cherry tomato, onion and pea shoots that were so dainty. This was followed by a tart filled with orange gems of salmon roe that bursted when we bit into them. Finally a tiny spoon with fish mixed with vegetable. Another starter was a mushroom soup that was poured into ceramic tea cups filled with foam, light truffle shavings and tiny croutons with truffle brioche. Even the wooden board it was served on was shaped like a cep mushroom. Then came bread -- a pastry with truffle paste in it, a delicious crusty sourdough bread, and another with lemon flavour. What was even more interesting was the spread -- there was whipped butter with olive oil, and the other was lard! We didn't have too much of the latter. 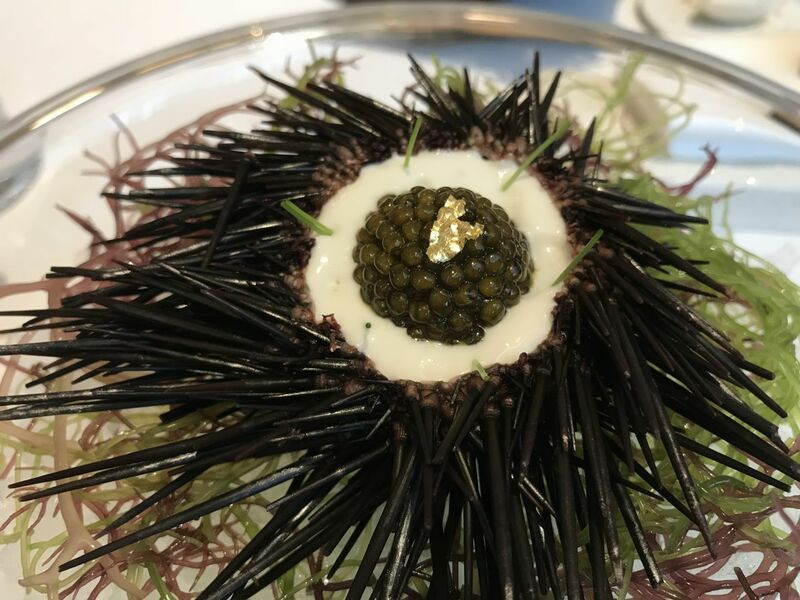 Finally the meal started with an impressive-looking dish of the sea urchin shell and in it was uni, spot prawn tartare, a foam made of mussels and topped with caviar and gold leaf. An intriguing combination that worked well together. 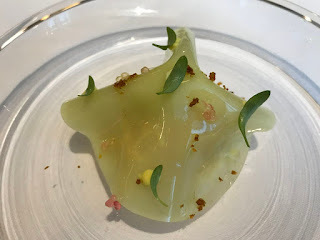 Next a "ravioli" featuring Japanese Kegani crab meat mixed with Granny Smith apple and celery, with Vadouvan spices and kaffir lime oil that was so light and refreshing. The sweetness of the crab balanced the tartness of the green apple, and added celery for a crunchy texture. Wow was all we could say. My favourite dish arrived -- heirloom beetroot variation, featuring segments of the humble vegetable that was also made into a sorbet, mini meringue and paired with horseradish, stracciatella and even honey. The plate was too pretty to eat, but we were encouraged to mix everything together to try the various flavours. Making a dramatic entrance was the rosemary smoked organic egg, presented in a lowly egg carton, but with dry ice flowing out of it. In it were two 63.4 degree Celsius cooked eggs flavoured with rosemary. They were carefully poured into a smoked potato foam and in it were bits of chorizo Iberico and meuniere sauce. We were instructed to mix it -- but not too much -- so that the yolk flavour would be more pronounced. Another wow. 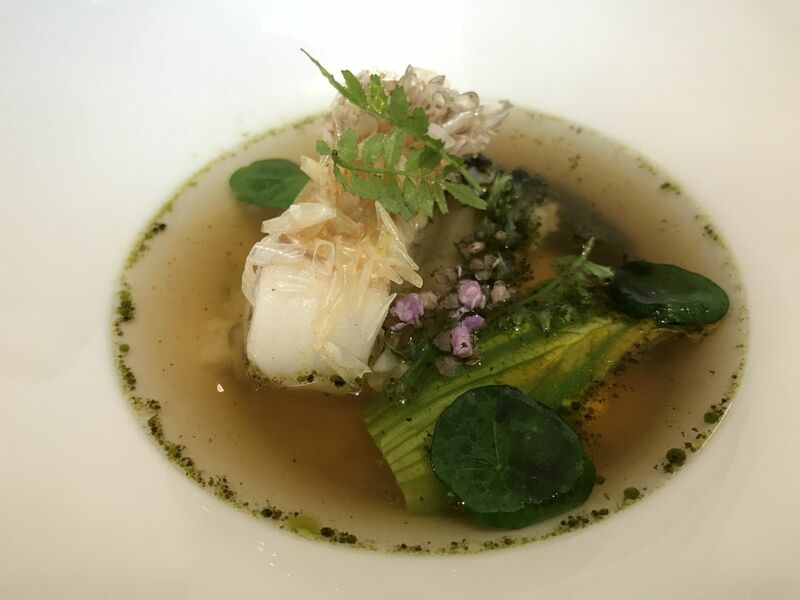 Crispy skinned amadai in a glass bowl made its way to our table, where smoked egg consomme was poured into the bowl that was garnished with yari ika and nori oil. The fish was delicate and perfectly cooked, what an intriguing consomme of eel! Who would think of that? The main event is Royer's signature roast pigeon dish, here it was covered in a pepper crust and cooked medium rare. It was accompanied with another humble vegetable -- corn and here it held its own with its crunchiness and sweetness against the juiciness of pigeon. Each pigeon leg has a different message attached to it tied with string, talking about how he loved eating pigeon as a child, or how one should eat the leg with your hands. We certainly polished it off down to the bone. Before dessert we had a cheese platter with some goat cheese, a triple cream brie, and comte, with the largest dates I've ever seen. Then we had our pre-dessert, a refreshing cucumber sorbet with seaweed sprinkled on small bits of meringue, and green apple granita. We would have already been satisfied with this dessert. But there was more. 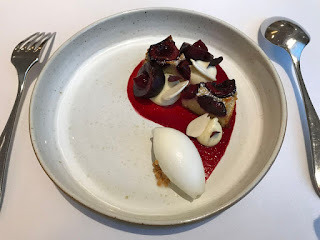 The actual dessert was clafoutis, a kind of flan cake, decorated with cherries, elderflower sorbet, vanilla cream and almond slivers. But wait -- there's more! Royer came to our table with an oval-shaped hive that revealed layers of petite fours. On top were two pomegranate lollipops, next mini matcha cream puffs, caneles, and finally homemade caramels. In the end the damage came to S$442 or HK$2,547 (US$325) for two. Considering we had two-star Michelin dining -- and the restaurant retained its two stars the following day when the announcement was made -- it was very good value. Many media at the Michelin announcement were disappointed that Odette was not elevated to three stars, but Royer insisted he was very happy for the team that the contemporary French restaurant retained its two stars and they would work harder next time. Nevertheless we were delighted, thrilled, amazed and sated by our lunch at Odette. 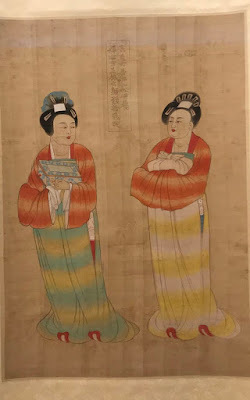 A chance to savour and to catch up with a dear friend who accompanied me. What a treat.